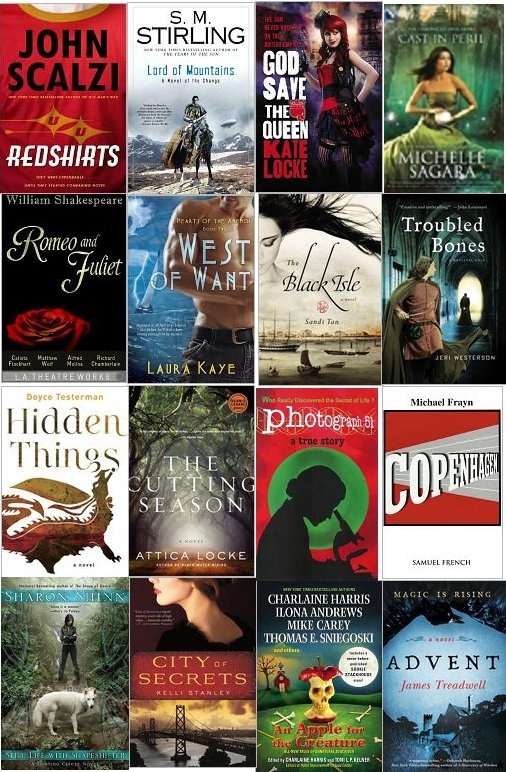 American Library Association – Escape Reality, Read Fiction! Last weekend, I resisted the impulse to buy books at RustyCon. However, I am being tempted again. This weekend is the American Library Association Midwinter Conference, otherwise known as ARC-city. There will be ARCs everywhere I look, and all just waiting to jump into my bag. Free for the taking. Of course, then I have to carry the things around the conference until I get back to my hotel. By the fourth (fifth, sixth?) book, the lead weight encumbers decision making. Too much of a good thing can be very heavy! I really hope that more publishers are getting on board with the idea of offering NetGalley or Edelweiss eARCs! 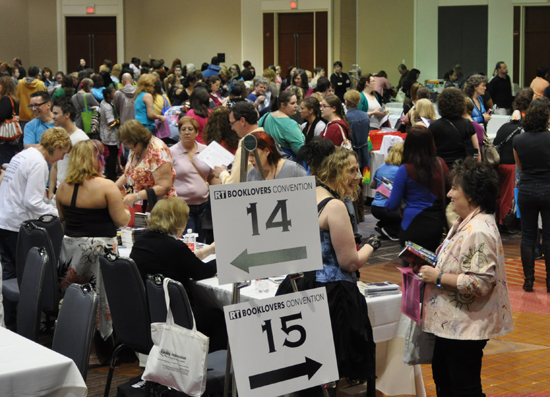 But what ALA isn’t, is a book convention. It’s not RomCon or the RT Booklovers Convention or even WorldCon. There’s a picture (at right) from the RT Booklovers Book Fair, where the description touts the 100’s of authors who are there just to sign books. That’s not what ALA is. The questions remain. Should ALA change their policies regarding exhibits-only passes to give preferential treatment to members and book-industry professionals? BEA has only just begun admitting the general public, and only on a very restricted basis. However, book reviewers, including bloggers, are eligible for attendance at BEA, it’s just more expensive than an ALA exhibits-only pass. Considerably more expensive. This isn’t just a question about ARCs. It isn’t even a question about ALA policy. 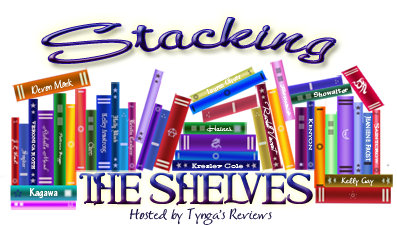 Why did the issue of ARCs touch so many hot buttons among both librarians and bloggers? What do ARCs mean to you? What does a massive ARC haul mean to you? Why do we covet ARCs? What do we do with them after the conference? And what will we do when publishers stop printing them? I’ve always wondered why the cliche is “sick as a dog”. Being owned by cats, I can attest that cats “sick up” every bit as messily as dogs. At least for their size. That being said, the blogger at Reading Reality, meaning me, came back from the American Library Association Conference sick as that proverbial canine. Feels like the flu. You know the drill. And since I love sharing, I’ve already given it to my husband. He still loves me anyway. But that’s why there’s no bookish post today. We’ve been lounging on the couch watching DVDs. This is why I collect back seasons of TV shows I like. We’ve blown through three seasons of NCIS so far. All puns intended. As you read this, I am probably standing, no, make that searching, the exhibit hall floor of the American Library Association Conference, trying to find hunting down last minute ARCs. 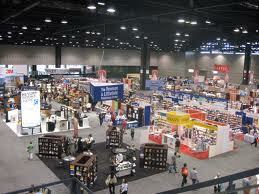 You see, the ALA exhibits are kind of like BEA for librarians. That’s not all ALA is, but that’s definitely part of what ALA is. 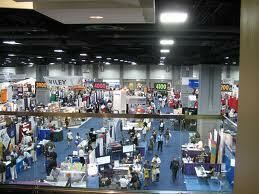 And on Monday morning, as the exhibitors are starting to pack up their booths, that’s definitely what ALA is. Miles and miles of books. Since I was going to send myself a box (or two) of books from the conference, I asked some non-conference going book-loving friends if there was anything they wanted me to look for, you know, while I was in the neighborhood. The Advance Reading Copy neighborhood, that is. Even though we are book bloggers, and we get ARCs, there are still some books we’re all chomping at the bit to get, just that teeny, tiny bit ahead. If we can. If there’s a chance. Here’s the “shopping list” my book loving friends sent me with. I was offered someone’s firstborn for the Kim Harrison. I’m not…interested. I’d rather have the book. But it says something about how passionate we readers are about getting our hands on new books. Especially ahead of schedule. Is there anything on this wishlist that you’re waiting for with the proverbial bated breath? What books are you on “pins and needles” about?